It was September 2012, and I was in Manhattan, acting as a street medic at the Occupy Wall Street first anniversary protests. They’d been happening all weekend but the biggest ones were going to happen next morning. Meanwhile, a bunch of protesters were crowding into Zuccotti Park, which was ringed by barricades and NYPD officers, with only one small opening for people to get in and out. I was talking cheerfully with my medic buddy C, a local as we entered the park. As we passed by the officers at the entrance, one smirked and gestured toward the street medic markings plastered conspicuously on my shirt and kit. “Those won’t save you from us tomorrow.” I stopped and looked at him, startled. C, normally famously unrattled by cops, snarled “She’s not wearing them for YOU,” and pulled me away. C’s medic markings were pretty small and discreet. That was true of most of the local medics I met. They, of course, could pull it off, because after months living in a park with and a year of showing up to protests with the same people, everyone knew who they were by sight. But the discretion wasn’t about a red duct tape shortage. It was about targeting. Street medics all over are familiar with medic targeting, but New York had been hit especially hard that year, with the police breaking a window with a medic’s head during a march (starts roughly at 0:13 of the video), and injuring another medic’s head so badly that she nearly died later from complications. You can listen to her, and her medic buddy (who was taken behind a police line and kicked during the same incident), talk about it here. I’d talked to yet another OWS medic at the Republican National Convention protests in Tampa who’d described being grabbed by a supervisory officer and thrown down the stairs. When I talk to people who don’t do protest-type activism or are new to it, they’re often very surprised at this theme. Some wonder whether street medics and street medicking aren’t protected by the Geneva Conventions (we are not; the Geneva Conventions apply to armed conflict, i.e. warfare). More commonly, they just find this to be unreasonably and pointlessly assholish behavior on the part of the police. We’re increasingly familiar with stories of police going after the people who film and otherwise document them, but street medics don’t have that role (having a GoPro strapped to you while medicking would violate the privacy of the people you’re caring for). So why not leave medics, health & safety trainings, etc, alone? I think it’s a combination of a couple of things – morale games (protesters tend to get very upset when something happens to a medic, and to be excited about learning health & safety info) and the belief that any attempt by activists to protect themselves, no matter how obviously nonviolent, is actually violent and dangerous. The same people who think that goggles are a threat because they’re self-protection from police violence, think the same thing about medics and health & safety trainings. There are people who think that the presence of medics can only signify protester violence. Police suspicion of street medics and their work has been documented at other protests, not just Occupy or Black Lives Matter. One of the medics who trained me has a story about their detainment at the 2008 Republican National Convention protests. 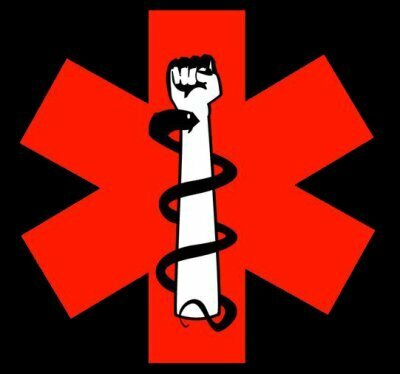 This medic was grabbed out of the crowd, accused of stealing the materials in their kit from an ambulance, searched, told that they would be turned over to the feds on charges of “medical terrorism,” threatened with being used to test the pepper spray, and had most of their stuff dumped onto the ground, before being released. This story and others of medic targeting at the 2008 RNC are recounted here and more medic targeting at the 2008 RNC is recounted here. The NATO Summit protests in Chicago saw this too, with a group of medics detained and harassed while eating pizza after a march. The Chicago PD actually planted a long-term undercover in the local street medic collective, during which that undercover tried to bring in a “friend,” incite protesters, and collect information on where out-of-town medics were staying during the NATO Summit protests. Cops lurked outside the local medic coordinator’s house, and hung around in crusiers outside the medic headquarters constantly, sometimes harassing the medics who passed by (in pairs, as we had been told in no uncertain terms by fellow medics not to walk around alone if we could help it). And there were several medics injured over the course of the weekend. One of my medic friends who started in the anti-globalization-movement days, back when they used to train people to be street medics in the days before big summits, has a great story about a Secret Service agent sitting in the back of the room all throughout a 20-hour medic training he was conducting. Yet another medic friend has a story about the 2009 Pittsburgh G20 protest, and the medic dispatch area – street medics coordinating other street medics, keeping track of them, helping them through tough cases, and sending them to sites where people are known to be hurt – being raided by the police, the medics volunteering there dragged out of the building. And of course, in Ferguson last year, a church-adjacent aid station was raided by police (while I was in Ferguson, actually), and materials for treating pepper spray and tear gas exposure seized. The aid station had been up since nearly the start of the protests, but a few hours earlier, it had provided a brief health & safety training for medics from protesters for the first time, and a few hours before that, medics had provided a first in-depthy health & safety training for Ferguson protesters, at a different site. There was some indication, based on the accounts of people present for the raid who saw and/or spoke with the police, that the timing of the raid was connected to these trainings. Going to the 2012 Republican National Convention protests, a medic bringing a case of first-aid supplies was questioned about whether she was going to the protests, and her case of supplies was seized by the TSA with no explanation, and not returned. I did a short health & safety training for protesters here in Boston last winter. When I crossed the street there was a police car parked in a nearby lot, for no apparent reason. When I passed by it turned on its siren, scaring the hell out of me, and it stopped the siren as soon as I was past it. This all makes so much more sense when you classify first aid and the provision of health & safety information as a threat. A special kind of threat indeed. “Rebellion,” the only threat on the Baltimore list to be classified as rebellion. Police and protester interactions in the US are very far from Geneva.